I don't know is RAM dual channel working properly. I've installed 2x4gb ram in my computer and the windows 10 says I've 8gb ram, but task manager show 4gb and PC UserBenchmark says "Performing below potential (32nd percentile) - ensure that a dual+ channel XMP BIOS profile is enabled". So I've checked BIOS for EMP, and I saw that it was turned on, but Idk why CPU-Z shows that I have my ram at 1st and 3th slot when I have only 2 RAM slots. By the way my motherboard is msi h110m pro-vd and my ram is Patriot Viper DDR4. What bit OS do you have? 32 or 64? exact model of the ram? My RAM: Patriot Viper 2x4GB Kit DDR4 PC4-24000 3000MHz CL16 with XMP2.0 ready and Quad Channel Technology. I have 64bit OS windows 10 Professional. I didn't mix OS'es and windows versions. My CPU is Intel Core i5-7600. Idk what is the lastest version, but mine is 1809 and it was installed on 06.02.2019, maybe you will know is it the latest. I've installed the newest BIOS and it worked, now my windows says that I have 5gb RAM available, but the benchmark is still looking for a problem, so is that ok? 5gb? 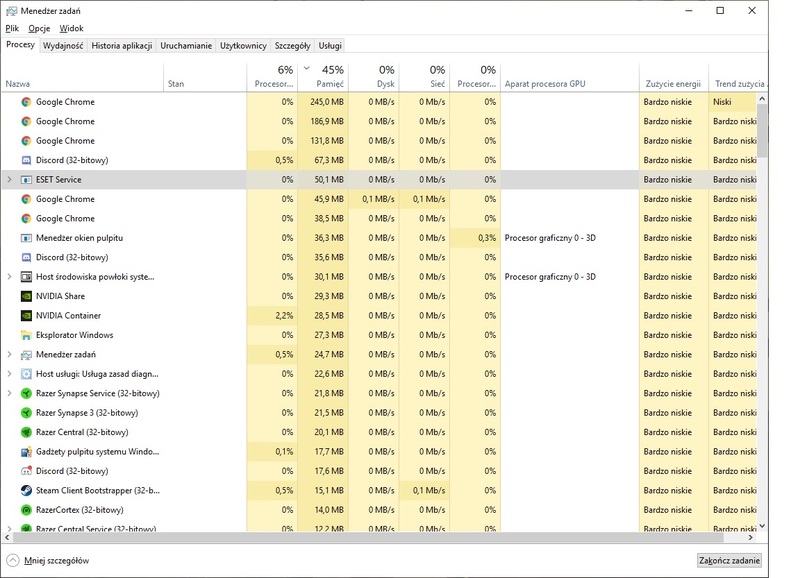 what resource monitor said what is using the ram? Every window was closed, if you're wondering. How To - Detailed instructions on posting images on Tom's hardware. Question Cannot find Quad kit. Help?